Calculations at a right parabolic segment. This is defined by a parabola of the form y=sx² in the interval x ∈ [ -a ; a ]. Enter the shape parameter s (s>0, normal parabola s=1) and the maximal input value a (equivalent to the radius) and choose the number of decimal places. Then click Calculate. The parabola shape can be drawn with the function graph plotter. ln is the logarithmus naturalis (natural logarithm). 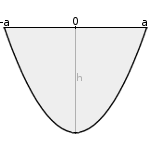 The shape parameter has no unit, radius a, height, parabola arc length and perimeter have the same unit (e.g. meter), the area has this unit squared (e.g. square meter). Although for the calculation of the area the value of the radius is taken to the power of 3, the unit is to the power of 2. This is, because the parabola function squares the length, but not the unit.